Developer Alexander Sviridenkov has released an updated version of this HTML Component Library for Delphi XE7 Firemonkey. The HTML Component Library is a suite of components that allow you to display HTML 4.01 and CSS3 cross platform on Android, Windows, OSX and IOS. Apparently it also supports the HTML5 video tag if you also have libvlc available. This HTML viewer component does not use the platform native web browser controls and therefor it doesn’t ‘float’ over the other controls on your form. This also means is is entirely cross platform because it is drawing and displaying the HTML elements with Firemonkey. It is 100% native Firemonkey and it is a commercial component with demos available. It should also support the latest version of AppMethod. The goal of the component set appears to be to provide HTML rendering capabilities for things like reports and charts. 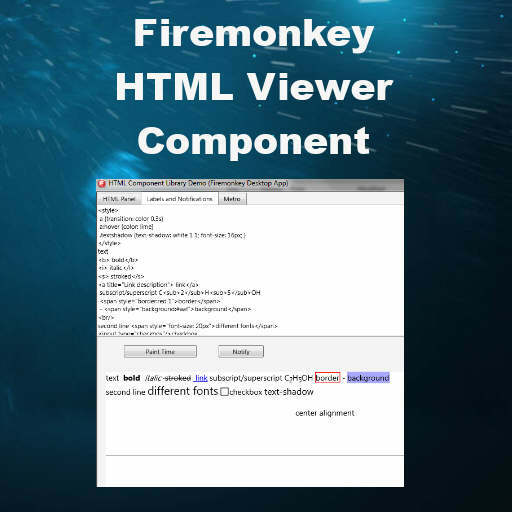 Head over and check out the other features of this Delphi XE7 Firemonkey HTML viewer component and then download the demo. Hello, is compatibility this component with jQuery mobile?